In 1856 Buchanan won the Democratic nomination in a grueling convention that rejected its more popular and more controversial candidates. He was elected president with only 45 percent of the popular vote and carried only four of the fourteen northern states. In their campaign platform, the Republicans had condemned the pro-southern President Pierce and his administration as criminals to be severely punished. In return, numerous southern leaders warned that the election of an entirely northern Republican president would justify and require secession. The Republican Frémont had won a northern majority, but Buchanan and the Democrats had won a slim national victory, greatly helped by the Know-Nothing candidacy of Millard Fillmore. Any further defection to the Republicans by northern Democrats in 1860 could easily elect a Republican president and make secession likely. Thus, Buchanan's goal of sectional peace would require first the reunification of the Democratic party. Party unity would demand of Buchanan a harmonious relationship with Senator Stephen A. Douglas, the party's most popular northwestern leader. Douglas had authored the Kansas-Nebraska Act, which repealed the Missouri Compromise barrier against western slavery and decreed that territorial citizens themselves could decide for or against slavery. Douglas was still popular in the South and had contributed much time and, by his own account, $40,000 to Buchanan's election. Buchanan, however, envied, resented, and disliked Douglas, and southern radicals considered the senator a threat to their ambitions. After thanking the famous senator in a letter addressed to "Samuel A. Douglas," the president awarded the northwestern political patronage, including cabinet posts, to Douglas' most bitter enemies. President Buchanan (center) surrounded by his cabinet. Seated left to right are Jacob Thompson, John B. Floyd, Isaac Toucey, and Jeremiah Black. Standing left to right are Lewis Cass, Howell Cobb, and Joseph Holt. president himself had been either out of office or serving as minister in England for the past eight years. The group was united by strong southern viewpoints and antiquated and often inaccurate assumptions. Many historians have considered Buchanan a weak president dominated by his cabinet, often called "the Directory," but this is incorrect. Buchanan was an energetic, shrewd, stubborn man who deliberately selected advisers and subordinates whose views he already shared. The unanimity with which they faced their opponents and the disagreement of historians with the wisdom of their policies do not mean that the president was a weakling. 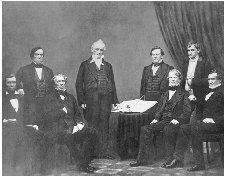 It is true that Buchanan did have a unique relationship with his cabinet. His niece Harriet Lane was his official hostess, but his cabinet members and their wives were his real family. They visited and came to dinner frequently and provided the companionship he needed. Cobb in particular occasionally lived at the White House for weeks at a time. Along with a few like-minded congressmen and senators, they were a clan bound together by intense loyalty and a total inability or unwillingness to recognize the wisdom, integrity, or justice of any opponent or opposing position. To the end of his life, Buchanan blamed the Civil War primarily on the work of a few misguided northern fanatics. The massive northern vote for Frémont in 1856 and for Lincoln in 1860 apparently escaped his attention.